1. The act of radiating or diverging from a central point, as radiation of light; divergence from a center, having the appearance of rays. 2. The therapeutic use of roentgen rays or radium. There may be negative, neutral and positive radiation. 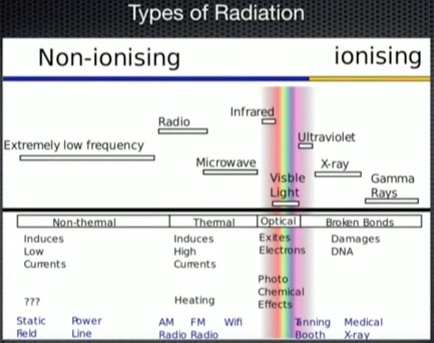 "Radiation is radiative activity. Modern science calls it "radioactivity.'" Radioactivity is merely the reversing of the time dimensions of the universal constant. It is the exothermal, exhalation of the One universal Being, of which every existing thing is. "Thermal radiation (and its negative, cold), the field of Prof. Dewar's researches, in Keely's system comes below the first atomic; while celestial sympathetic radiation comes as the fountain head; the compound interetheric, from which all aggregated matter springs, the governing force of all aggregations. If there were no sympathetic radiation from the great celestial center, space would be void of suspended, or floating, earthly and gaseous matter; consequently, planetary worlds would never have had their birth and growth. Radiation = Death or Evil ? Some substances are inherently evil. Reference: Walter Russell, who strongly opposed the development of Plutonium (named after the King of Hell) and the other transuranic elements. I believe, along with several Mennonites of my acquaintance, that Plutonium is the Abomination of Desolation that Jesus warned us about. I wouldn't say inherently evil. Perhaps lacking in 'solid' harmony. The universe is said to spring from the mind of God, PERFECTLY GOOD! Paul, Russell considered these heavier elements as "dying". Nowhere have I read Russell considered these elements as evil, sinful or "Abomination of Desolation" in a personal, spiritual or moral sense. Yes, degeneration into chaos but not something inherently of a moral nature. This does not imply death but a disintegration to dispersion wherefrom they are re-integrated again as whole as hydrogen. There is no death - only transformation from one state of consciousness to another. Life = cohesion / harmony. IMHO, What the bible refers to as sin is really something "not contributing to waking up to Whole Mindedness or Christ Consciousness". Ex: One would be commiting sin if what they did or thought brought them closer to body-mind or focus on materiality instead of the essence that is life / spirit. I would lump "evil" into this category. Again, IMHO, there is no evil or sin per se - there is only thought - which may be constructive towards wholeness or destructive towards chaos of body, mind and spirit - as Paul says above, going to enharmonicity (chaos). So in a sense you are correct in a different sense. There are two main forces operating in the universe. The force that concentrates to a whole form (syntropic, harmonic) and an energy that disperses form to chaos (entropic, enharmonic). These are natural forces doing what they do best - being what they are. There is nothing inherently evil about either one. In fact one could not exist without the other to counterbalance it and give it meaning. The heavier elements are sympathetic to the enharmonic conditions and hence are dispersing into radiant energy and chaos (lack of orderly form).